TMWebViews allows you to access and share your standard, and custom Time Matters ® Power Views through a secure portal on the web. Securely share the new version 10 “Activity” Power Views with co-counsel or selected clients enabling them to check case status online. Restrict specific user’s access to specific types of information. Optionally allow selected case documents to be downloaded directly from the Power View. The TMWebViews information is pushed outbound only via the secure Web proxy/portal. It is impossible for users on the Web to ever directly connect to, or communicate with the client's server or Time Matters database. Optional two layer security requires a user first successfully login to the Web portal, then log in a second time to the actual TMWebViews page. The law firm does not need a static IP address or any special router configuration. TMWebViews installs on your server like any other program. Click here to watch a short TMWebViews demo video. Contact us for a live demo of the product or to discuss how to use TMWebViews in your firm. TMJustice is a custom Web portal for LexisNexis' Time Matters ® software. It is designed specifically to allow prosecutors to securely share case information with various law enforcement and justice entities, such as a sheriff's office, jails, city police stations, courts/judges and a clerk's office. These entities need access to the prosecutor’s case information so they can coordinate their efforts. 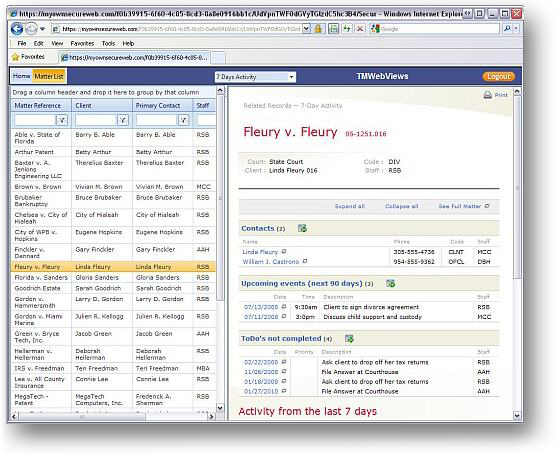 TMJustice allows these entities to see information like defendants, case numbers, assigned prosecutors and defense attorneys, charges, incarceration status, next hearing date, next trial date and so on. Some entities also need all, or carefully restricted, access to case documents. Preconfigured views allow case information to be easily filtered and grouped as each user requires. Authorized users can export the case data to PDF or Excel. New TMJustice portal users require practically no training to find the information they need in seconds. Click here to watch a short TMJustice demo video. 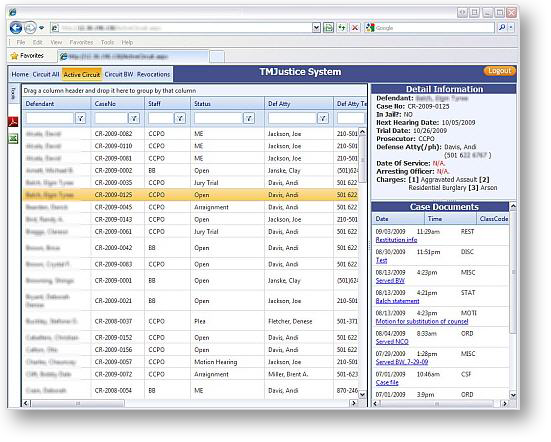 Contact us for a live demo of the product or to discuss how to use TMJustice in your firm. NOTE: TMJustice is just one example of how Matters in Motion can build a custom portal to Time Matters for secure use on the web or just on the PCs/Macs in your office. If you want to see your Time Matters® information on a Mac, a custom web portal is an option for you. If you like the capabilities Time Matters® offers but wish it looked “just so” contact us to discuss our custom development services. Spending too much time at the office? Would you like today’s appointments and yesterday’s performance numbers in your email inbox on your iPhone, Blackberry or home PC? Phone numbers for today’s appointments. Staff Productivity yesterday, this week and last 30 days. Firm billing yesterday, this week, last 30 days and year-to-date. Case Load Report shows firm growth as historical trend of new cases vs. closed cases. You and your staff invest the effort into managing your world with Time Matters ® . Get the most value from that goldmine of information delivered where and when you need it! Delivery of reports can be tailored to your needs. Want your calendar in the morning and productivity reports in the evening – no problem! Want your calendar at 7:30 and Noon – done! MatterFX – What do you want in your inbox? 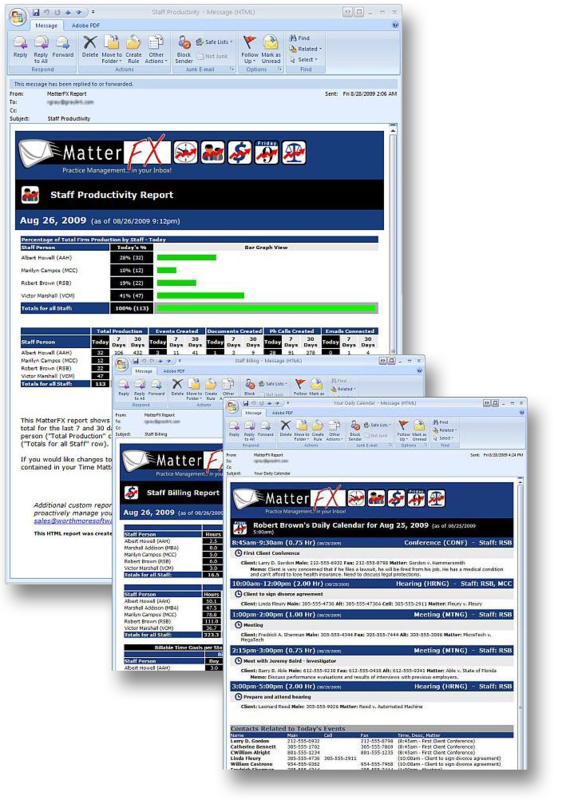 Contact us to learn more about how MatterFX can help you proactively monitor the productivity and health of your firm. CaseWORTH is a comprehensive and innovative new legal software application. It helps you efficiently and expertly manage the enormous quantity of financial information for personal injury, medical malpractice, social security, and worker’s compensation cases. Organize and track medical bills, medical records, insurance payments, and personal expenses such as lost income and potential future earnings with CaseWORTH. One of the greatest and most time-consuming challenges you face as a personal injury attorney or paralegal is collecting and managing the financial details of a case and building a usable work product from that detail. CaseWORTH automatically manages all of the financial details for you in one place. CaseWORTH allows you to attach the supporting facts and documentation directly to this financial history. As you discuss the money spent or lost on each date, the facts and answers to the opposing party’s questions are visible directly from each financial entry. CaseWORTH’s Settlement Calculator and valuable reports allow attorneys to analyze the case potential and negotiate the best possible settlement for the client. CaseWORTH automatically generates a Medical Treatment Chronology report, and even prints a Settlement Statement ready for the client to sign. When updated case information is entered, it is immediately reflected in all summaries and reports. With CaseWORTH, building concrete documentation is just one click away. Put the latest technology to work for you in successfully managing your litigation matters. Secure the necessary funds to take care of your client during difficult times. Click here to watch a CaseWORTH demo video showing a small case created and settled start to finish in 10 minutes. Click here to read a recent CaseWORTH review published by “Legal Assistant Today” magazine. Click here to see how CaseWORTH links with Time Matters ® . Click here to watch CaseWORTH training videos on demand. Contact us to learn how CaseWORTH can help you manage the financials and get a bigger settlement faster on your next case. © 2009 All rights are reserved by Matters in Motion, Inc.
Time Matters ® is a registered trademark of LexisNexis ® , a division of Reed Elsevier, Inc.
All rights reserved. LexisNexis ® is a registered trademark of Reed Elsevier Properties Inc., used under license.